The fibre I ordered from Wingham's showed up on Friday afternoon which was impressive considering I only called them on Wednesday afternoon - so top marks to them for prompt delivery! I had it delivered to work, much to the puzzlement of colleagues who couldn't work out what the bag of squidgy stuff was or why it would be delivered to me. 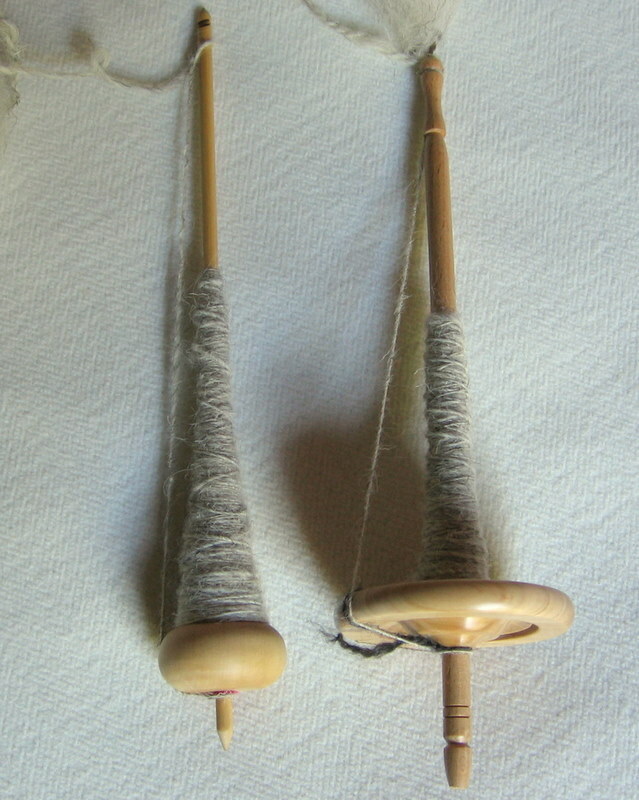 I did try to explain that it was fluff or more precisely fleece for spinning, but met generally blank looks. Fortunately, I resisted the temptation to open the package and make them feel the contents, otherwise I think all credibility may have disappeared at that point. I was glad the bag was squidgy though, it made lashing it to the back of the bike easy enough, once I'd figured out how to hook on my bungees. Once I did get it home, I wasn't disappointed. Blue Faced Leciester in Humbug looks very pretty and soft and I'm looking forward to seeing how it spins up. Saturday morning saw me heading off to the Coventry Spinners, Dyers and Weavers Guild for a first time visit. I only stayed for an hour and a half as this was a brief visit to see what they were all about rather than staying for the full day. It was interesting to see so many people with spinning wheels in the same room and the ladies themselves seemed nice enough. I went along with Claire and caught up with both Kellie and Mandy, which helped as walking into somewhere new on your own is always a bit nerve wracking. Claire spins exclusively on spindles, so I showed her my spindle and my technique and it turns out my spindles are not as good as they could be. She demonstrated spinning on her spindle and with a single flick, she got it spinning for a good 40 seconds compared to the 2-4 seconds I could manage with mine! 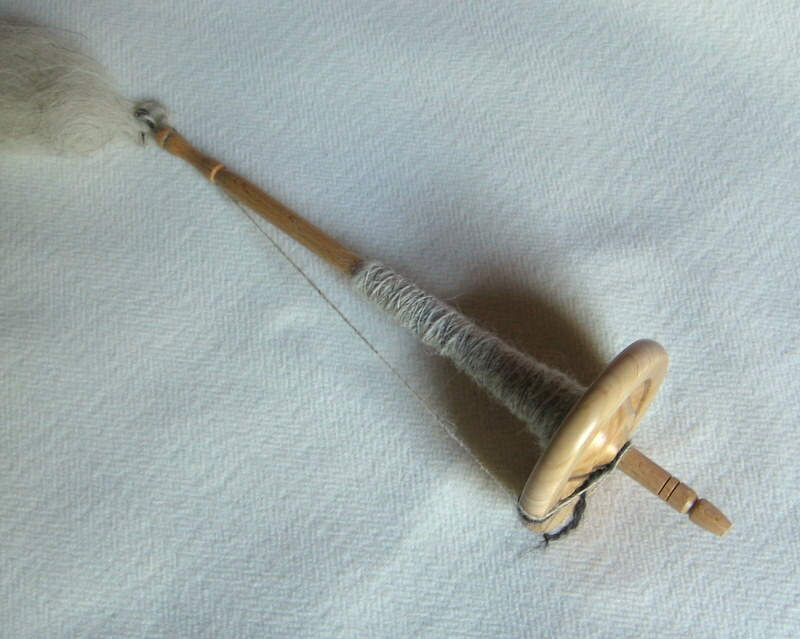 I had a go with her spindle and even in my inexperienced and definitely novice hands, that spindle spun for a good 20 seconds before running out of oomph. And after a practice at home, I can confirm it does spin very well, so well in fact that I managed to spin without using the park and draft method!!!! Admitedly, now I have to watch to make sure I don't draft out to thinly and watch how much twist is sitting just above the spindle or it snaps from over spinning - I have an idea how to fix that, I'm thinking I back spin a little, just in the area above the spindle before winding on - but with the spindle spinning I can concentrate on drafting, which is where I really need to improve. I was so happy I took the spindle to Dave and made him admire it... I now have suspicions that this will go the same way it did when Esther leant me her sewing machine and I may decide I have to have one just like it... But for now, I shall continue to practice and see how it goes. Thank you Claire! Claire also leant me a DVD which shows how to use a spinning wheel but I haven't looked at it yet - I'm saving it for next week when Dave will be off in Ripley for the AscendancyLRP tabletop battle. Wa-hay a bag of fluff and a spinning success, sounds like you may be spending on new spindle. Do I take it your not coming upto Sunny Ripley next Sat then?